As the most popular recreational game in the country, golf is certainly the most difficult to play well. For us to enjoy playing golf, we need to take this complicated game and find a way to simplify it. That is easily done, as this article will show. There are three basic playing skills in golf: hitting the ball straight, getting close-in shots on the green the first time, and accurate putting. We shouldn’t be too concerned about how pretty we look while doing it (pretty is as pretty does), nor should we be bothered by exactly how we get the job done. Our only task as golfers is to keep advancing the ball closer to the hole. The quickest way to do that is to hit the ball straight, walk up to it, and hit it straight again, then knock it into the hole. So far, so obvious. But how to do that? After you have learned a basic golf swing, or chip or putt, here’s what you should do with it: use it to hit the ball. Use your swing to hit the ball. You don’t hit the ball, your swing does. That’s a huge difference in approach. Golfers who try to hit the ball with a golf club are thinking of the end result. They think hitting the tiny golf ball with a tiny clubhead is a fine motor skill, the golf club being an extension of their hand which can be guided finely into the ball to achieve a pure strike. This leads only to failure. A golf ball is not something to be hit or hit at. It is an object to be swung through. When thinking changes from “hit the ball” to “swing the club,” the entire game becomes easier and you hit better shots. One way to look at it is that you should be truly surprised when the club meets the ball. Not that you can’t believe you actually hit it, I don’t mean that. It’s rather than you should be so caught up in your swing that you don’t realize until after you have hit the ball that this was what was intended all along. How do you do that? It’s obvious you’re standing up the ball to hit it. How do you surprise yourself? Simple. By fooling yourself. By learning to ignore the ball even when it is right there in front of your eyes. By forgetting all about the fact that your goal is to hit the ball, and concentrating on making the best stroke that you have trained yourself to make. This thinking goes for every shot, from two-foot putt to swinging a driver. What it leads to is minimizing or even eliminating tension in your swing. Tension, caused by trying to hit the ball to get a result, pulls our stroke out of line or off plane, rushes it, just plain gets in the way of us doing what we taught ourselves to do. You swing, the club hits, and the ball flies. Keep the game that simple in your head, and you will play better. The greatest joy in golf is to hit a shot as straight as you planned, as long as you planned, and to make everyone in your foursome say, “Nice shot!” The greatest frustration in golf is not being able to do that every time. You did it once, why can’t you do it again? I’ll show you how to do it again, and it’s so simple you can do it in your armchair. Literally. 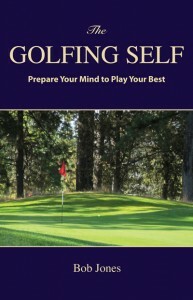 Your best golf will come out after you master two mental skills. One is to detach yourself from the results of your swing and focus only on your swing itself. The second is to think of the golf swing as a continuous chain of feelings. I’ll explain the first one by using an example from your experience. Suppose you have to clear a water hazard to get to the green and you think the risk is to great for some reason, so you decide to lay up. All you’re going to do now is advance the ball, not hit it at any target. As long as the ball goes further down the fairway and ends up short of the water, you’ve done your job. And what happens? You hit the shot of a lifetime–straight, long, just a gorgeous shot. Why? Because the end result was so simple, there was not target to hit, no goal, you didn’t think of an end result. All you thought about was swinging the club. That’s why you hit such a good shot, and if you can do that with every shot you hit, forget where you want the ball to end up and just swing, you will get the same result–your best. The second skill is a little more subtle, and might be new to you. As golf is taught, and as many golfers think, the golf swing is a sequence of positions. We learn golf by learning how to hit each position on the mark. They are positions you can see in a book, see yourself achieving in your mind’s eye. Swing thoughts are born. 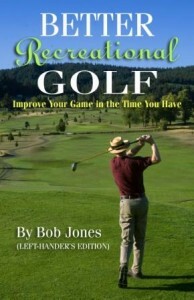 Swing thoughts are instructions for what to do to make your golf swing be successful. They fail us because there are many ways to do the same thing, and if we concentrate on the what we miss the how. Reminding yourself to keep the clubface square thought the swing says nothing about how to do that. For most of us, there is but one way to put a physical suggestion into practice. This is because of the way our bones are put together, the way our muscles are developed, and the habits of movement that we have acquired over the years. Everyone will express the same instruction differently. What a golfer must learn is how each movement feels when it is done right. The golfer must learn, memorize, how it feels for this succession of correct feels to flow together sequentially from start to finish. The golf swing must be felt as a whole. Earlier I said these two skills that can be learned in your armchair. They can, and that is the best place to learn them. You can learn to shut out of your mind everything but making a golf swing. You can learn to imagine yourself swinging, what a unified swing feel like, instead of going through a checklist of technical points. When you get to the course, put your armchair practice into play in this way. Select your shot, pick your club, take your address. Stand upright for a moment and review the unified feel of your swing in motion. Preview in your mind how your swing is going to feel. This shuts out the result from your conscious mind. It also gives your subconscious mind the instructions it needs to give to your body so this swing can be executed. Then bend over the ball once more and without hesitation, swing away. Let go of consciously trying to control your result by controlling your swing. Let your mind encourage your body to do what you know is right, and you’ll get the results you want. I played 18 last Friday, and on the 17th hole I hit the shot of my life. The result wasn’t much, it was just a 7-iron into the green. It went straight and as far as a 7-iron usually goes for me. What made the shot special was the feeling I had when I was hitting it. Just before I took the club away, I had a real good feeling, like there was nothing to it, if I just take the club away there is nothing to worry about. I remember getting to the top of my backswing, and starting down. I remember hearing a gentle click, but the next thing I was aware of was standing facing the target, watching the ball, in a textbook finish, with perfect balance, and no feeling of expended effort. I have never felt that way before, and it was wonderful. How did it happen? What made that shot so easy? Balance. In balance from address to the finish, a golfer finds that all effort is directed toward the task, hitting the ball, and none toward keeping the body under control. A balanced body is in control. A powerlifter once told me that the key to lifting greater weights is to lift the weight absolutely straight up. If the barbell wavers a bit forward or back as it’s coming up, then energy must be expended to stay balanced, energy that could be used instead to lift the weight must be redirected to another purpose. Do you want to know how to get maximum swing speed and the most accurate hit? Keep your body under control by maintaining it in balance throughout the swing. You don’t have to hit the ball hard. Just don’t waste energy on things that don’t have to do with hitting the ball and you will hit the ball hard and far. Do you ever see an LPGA player with less than perfect balance? Of course not. That’s one reason they hit the ball so much farther than you do. There is no wasted energy in their swing, and it’s all because of their balance. Do you want to improve your balance? Here’s how. Hit wedges, lots of wedges from 40 to 80 yards. Go to the range and hit pitches with your first 30 balls. Use your gap wedge. use your sand wedge. Make easy swings with each club, thinking only of good contact. After you’ve hit those 30 balls, hit one with your driver. You will go, Wow. But forget about the ball did. Remember what that swing felt like, and how it ended up. It was effortless and you hit the drive of the year. Those 30 wedges put balance into your brain and you stayed balanced when you hit the driver. Let’s repeat the lesson. To hit the ball well, you have to hit it hard. To hit it hard, you have to use all of your energy to hit the ball, none for other purposes. The way to do that is be in balance from start to finish. Now go and hit those wedges. Go! You hear a lot about the scoring zone in golf, the place where your score really gets made (or not). Some people say it’s from 100 yards and in, there are books written about 60 yards and in. For the recreational golfer, it’s 25 yards and in. If you play once a week and can only practice that often or even less, your scoring expectations from too far away from the hole can’t be too great. There isn’t enough time for you to learn how to get up and down from 50-100 yards consistently. Apply yourself instead to learning how to get up and down from 25 paces from the pin or less. This, you can do. Those are the up-and-downs that can take bunches of strokes off your score. Here’s how to make them. Let’s say you’re just off the green on the fringe. The grass is cut shorter than the fairway, but longer than the green, and the lie is tight (there isn’t much of a cushion of grass beneath the ball). The club to pull is your putter. Forget your 6-iron or your sand wedge, or whatever you chip with. It’s the putter that will put the ball tap-in close. Arnold Palmer said that your best chip is as good as your worst putt. It’s true. Spend some time on the practice green finding out how much harder you have to hit the ball to get it through the fringe. Find out how much fringe you can reliably putt through before you do have to reach for that sand wedge. Say you’re about 60 feet from the hole and too far off the green to putt. The club to use is the one that will get the ball about six feet onto the green and run the rest of the way. Spend a few practice sessions learning which clubs to hit with different ball-fringe and fringe-hole distance combinations. This is a better shot than flying the ball to the hole, since a rolling ball has a much better chance of going in the cup. The third shot you should practice is a shot out of the rough. Use your sand wedge. The key here is to know where the bottom of the ball is, and make sure the sole of the club gets down to that point. When the ball is sitting well down in the rough, you have to go down and get it. But sometimes the ball sits up in the grass, and your club has to stay up where the ball is so that you don’t slide the club underneath it. If you have these three shots down, you will start making pars right and left. There’s one other greenside shot I didn’t talk about isn’t there? The bunker shot. But since everyone says that’s the easiest shot in golf, you already know how to hit that one don’t you? In another post, I talked about which clubs are the most important for you to be able to hit. (See The three most important clubs) Now I want to talk about the most important shots, which is not quite the same thing. We’ll break this down into two parts: the good shots to hit, and the bad shots to avoid. First, the good shots. The tee shot. Getting the ball into the fairway off the tee is a critical scoring shot for recreational golfers. My advice is this: do not tee off with a club that has fewer degrees of loft than your average score over par. If you aren’t breaking 100, the 5-iron (28° of loft) is your big gun. A 6-iron might be a better choice. Break 90 regularly and you can move up to a 19-degree hybrid iron, which should get you 190-200 yards off the tee. Drivers in this scheme are for golfers who break 80. The 7-iron. Play from tees that let you hit lots of 7-irons (or less) into the green. Then get very good with this club. The approach putt. Go to the practice green and develop a stroke that hits the ball 30 feet, every time. This shot is two-putt insurance. Sand. Can you just get the ball out and onto the green? For recreational golfers, sand saves are accidental without volumes of practice, but down in four, you shouldn’t be doing. Now for the bad shots you want to avoid, which, quite frankly, are not that hard to avoid. I see golfers wasting strokes all the time on these shots. Hitting your fairway metal out of hairy lies just because you’re a long way from the green. Instead, chip out to the fairway and play on from there. Hitting over water when you don’t have to. Or if you have to hit over water, using a club that you have to swing just right to get the ball in the air. Flying the ball to the pin when you could run there. The first shot is much more risky than the second, and seldom more successful even if you pull it off. When I take a golf lesson, I always hit the ball well. That’s because I don’t want to waste the time I have (and am paying for) with the pro, so I make sure my best swing comes out – at least as often as possible. I figured, why not do this when I play, as well? I imagine him standing about five or six feet away from me, where he normally stands, watching. Now I don’t want to waste a shot and make no progress, so I get into my best swing mode. Et voila! One good shot after another. Not one great shot after another, but every one is playable and there are no clinkers. The reason I think this works is that it takes my mind off all the details and onto the one thing that needs to be done – hit the ball cleanly. And that’s what happens. Imagine someone is watching with a critical eye. Works for me. This winter I learned how to hit the ball in both directions — curve it left, curve it right — on command. Those are good skills to have , in that learning them makes you really think about what you’re doing when you hit the ball. It’s not just rear back and fire. There has to be a purpose to the shot, and playing with direction focuses your mind in that regard. Even though that sounds like it might make the game harder, knowing how to work the ball actually makes the game easier. I’ve been playing lots of practice rounds since the new year began, and when I first went out I was hitting the ball straight, as usual, or at least trying to. Lately though, I have been noticing that it is easier to curve the ball on command than it is to hit the ball straight on command. A lot easier. For instance, the 18th hole on my home course present you with the Scary Tee Shot. Water on the right, trees and a creek on the left. There’s no room to be anything but straight. Normally I play left to avoid the water. That puts bogey in play to avoid the double. For some reason, today it just made sense to start the ball out to the left and swing it back into the fairway. So I did that. Worked like a charm, and it was stress-free! I knew at worst that the ball couldn’t swing left, it would just stay left and end up in the fairway on that side. I also knew the ball couldn’t go in the water, because the could not swing that far to the right. So the shot comes off just as planned and I’m in the fairway, dead center. It was easy. Back up to the 12th hole, and I’m in the fairway, right side, of a right-angle dogleg hole with a tree between me and the green. So I just took out my 2h, drew the ball around the tree, and got a room-service birdie putt. Without knowing how to curve the ball, I would have had no option but to punch up the fairway. I do not believe that learning to work the ball is an advanced skill. It is an intermediate skill that will help to turn you into an advanced player. Get lessons, work on it, learn to apply it on the course. 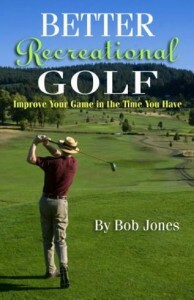 You will be amazed at how easy golf can be.